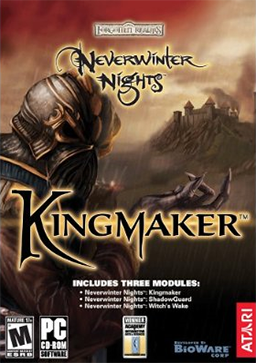 Neverwinter Nights: Kingmaker, one of three expansion packs for Neverwinter Nights released by BioWare, won the Academy of Interactive Arts & Sciences “PC RPG of the Year” award for Computer Role Playing Game of the Year for 2005. Kingmaker’s setting is the Keep of Cyan, a northern part of Neverwinter Nights’ world. This single-player game’s goal is to persuade several guilds to aid in being elected Lord of the Keep. The player must defeat his nemesis, the Masked Man, a mysterious mage with a small army of minions.